Welcome, everyone, to the first “Fridays with Franklin” Knit-Along at Makers’ Mercantile. I could not be more delighted at the number of you who have chosen to join us. 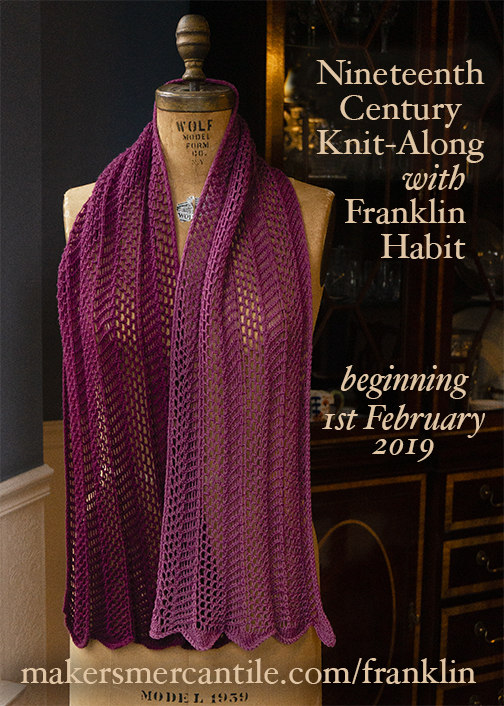 Our journey will be into, and through, a pattern from the early days of knitting as we know it–knitting as a pastime. The history of knitting is awfully sketchy. Our beloved craft has been very good at keeping out of both the written and visual records. Nor does as much of the work itself survive, certainly far less than we would wish. That makes the occasional glimpse of it all the more tantalizing, but does mean our timeline is more full of holes than…well, than this thing we’re about to knit. 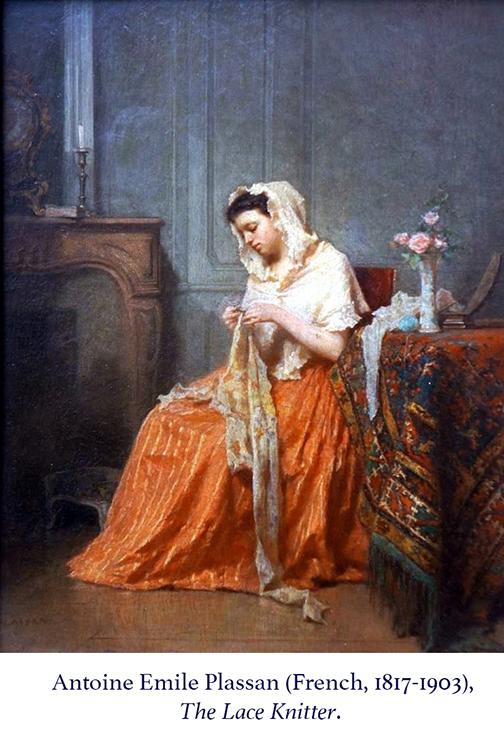 What we do know is that the widespread adoption of knitting by hobbyists–people, mostly women with leisure time, who knit because they wished to rather than because they had to–emerged in the first half of the nineteenth century. This woman, handsomely dressed and comfortably seated in her bourgeois drawing room, is emblematic of this new species of knitter. 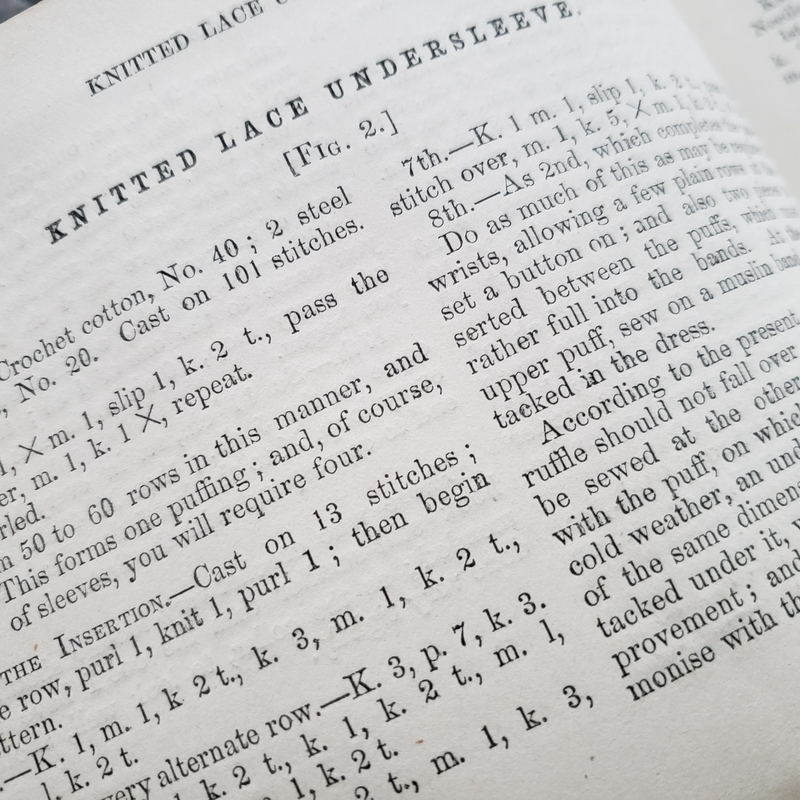 Prior to the late 1830s, we find no knitting books as we think of them today: collections of patterns aimed at instructing the amateur at home. Then…kaboom! They were everywhere. What happened to bring on this sudden flood? More on that in a later installment. For now, here’s what I’d like you to know. When I teach classes on working with nineteenth century patterns, one of the first obstacles I encounter is the physical appearance of the patterns themselves. They look horrible. Pages crammed full of cramped type, few illustrations (if any), and archaic terminology that befuddles the novice. This isn’t our pattern, it’s not even from the book our pattern came from, but it’s pretty representative of what you get from the 1840s through about the 1870s. The common impression is that because these patterns look primitive, the objects they generate must also be primitive, or at least clunky. One of the reasons I chose this particular pattern for our knit-along is that it is relatively simple while also being fabulously inventive. As I rummaged through my collection looking for likely projects, I was able to envision (as you likely do with modern patterns) what was going on, even without the benefit of a photograph. Reading through this piece, I could see that the structure wasn’t unusual. The basic unit of lace knitting is an open increase (a yarn over), and a corresponding decrease. Unless a yarn over is being used to shape the garment, it will always have a corresponding decrease somewhere in the fabric. It might be close by or far away, but it will be there. A bit of scribbling on my graph paper confirmed what I suspected from reading. 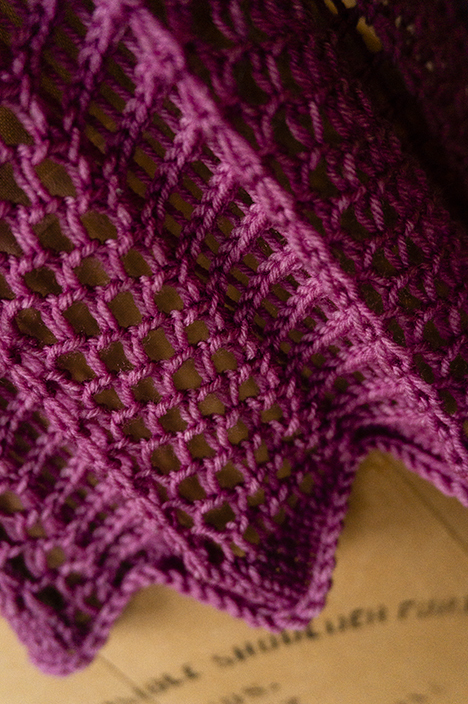 This stole used the standard unit of yarn over-plus-decrease to create lacy chevrons, like this. That is the single most common arrangement in all of lace knitting. It’s day one of learning to design lace. This wasn’t a novel prospect, but hey, it could be pretty. Then I noticed how many different forms of single decrease (in which two stitches become one) there are in the pattern. And the designer is very, very specific about them–she does not merely say to decrease, or narrow–which was quite common at the time. She tells you exactly which decrease to use where. Now, that was intriguing. Why do that? There could be many reasons. It could be a fault of the designer–needlessly complicating what could have been quite simple. That happened then, just as it happens now. So I cast on a swatch, and after one full repeat I was hopping up and down like a little kid at his birthday party. Because these decreases–one of which I had never seen before–didn’t merely keep the stitch count consistent. They actually changed, significantly changed, the appearance of the fabric. The chevron structure was there, but the finished lace looked remarkably different. Now, a couple of notes before you begin. I know, it’s more reading–but skip these at your peril. Our official yarn for the project is Infinito, available in the United States exclusively from Makers’ Mercantile. The structure, colorways, and fiber of this yarn made it a perfect companion to the pattern, and one skein will give a about a five-foot long piece if your gauge (see below) is akin to mine. Infinito is a yarn specially dyed to give a sloooooooooow transition from one color to the next. The beginning of the color repeat is marked by an undyed (white) passage which, depending upon where you start winding, will either be at the beginning or end of your wound ball. This white yarn is not meant to be knit with. It may simply be cut off. It is not included in the listed yardage of your skein. We’ll keep it fuss-free. With needles that seem like they’re about the right size, cast on 24 stitches and work in garter stitch until your work is about 4 inches long. That’s not very much knitting, honestly. When you’ve got that finished, take your gauge measurement. You don’t need to bind off the swatch, or block it. In fact, take care not to stretch it. Just measure. If you’re off, go up or down a needle size and try again until you get into the right neighborhood. Then pull out your swatch, and cast on with those needles. Our cast on is the designer’s preferred method–the knitted cast on. Is it lovely and stretchy? No. Is it simple? Oh my, yes. Do you have to use it? I recommend that you do, as the appearance of the finished edge depends upon it, and it also allows you control how much of a yarn tail you’ve got left when you’ve finished casting on. Keep it to between six and eight inches. If you have not done a knitted cast on before, please allow me to offer this instructional video. No joke, please listen, it absolutely matters in this pattern what decreases you use. If you substitute decreases that you prefer, but the designer did not order, we cannot be responsible for what you end up with. It might be fine, it might not be. We dunno. So please use the prescribed decreases. Some of them will be familiar, like dear old knit two together (k2tog) and purl two together (p2tog). Others, like lpd–which I hadn’t encountered even with all my rooting around in the nineteenth century–are likely unfamiliar now, but will be old friends by the time we are through. None of these decreases is particularly difficult to master, so don’t worry. Slp-slk-k2tbl: Slip as if to purl, slip as if to knit, knit two together through the back. Now, about the pattern. In order to make this knit-along as accessible as possible, the pattern will be posted as both line-by-line instructions and as charts. Neither is a superior way of working the pattern. The original version of the pattern–which you’ll see at the end of of the knit-along–was written line-by-line, as knitting charts are for the most part a twentieth century innovation. Patterning occurs on almost every row. For this reason, you will see that almost all rows after Row 1 are charted. Read and work every row in the chart beginning at the number for the row. If you do not do this, you will not get the correct result. Gather your yarn, needles, and notions, and head on over to the Ravelry group!